The Ebola epidemic in West Africa is a disaster. That&apos;s not a judgment about the response or a prediction of where things might go next, but an observation. The father of modern disaster research, sociologist Enrico L. Quarantelli, has defined disasters as sudden, hazardous events that disrupt routines and reflect "weaknesses in social structures or social systems." That&apos;s a pretty solid description of what’s been going on for the last ten months in Guinea, Liberia and Sierra Leone, where public services have broken down, cultural practices have been thrown into doubt and even burial workers are left striking for pay. Having been through earthquakes, hurricanes, tornadoes, floods and, yes, a catastrophic outbreak during my time as a reporter, I can tell you each is unique in instance and kind. But there are some important similarities in the way all of them affect people&apos;s lives, and in the way governments, aid groups and media respond. Which is why, far from the hot zone, but in the middle of an epic American political and media freak-out, it seems like a good time to remind people on this side of the divide to chill. In disaster zones such as Ebola-stricken West Africa, despite some durable myths, people tend to be resilient and cooperative. It&apos;s on the outside, where threats are abstract and hazards theoretical, that we operate in one of two modes, apathy and panic. Both are destructive. For much of this crisis, international apathy has been the biggest challenge: The front-line medical aid group Doctors Without Borders recently criticized the international community with failing to respond seriously to the Ebola outbreak when it would have been easier to deal with, waiting until it was a complex, widespread emergency, with more than 3,000 people dead, 7,000 infected and medical infrastructure in three countries on its knees. Where the threats are abstract, we operate on one of two modes—apathy and panic. Both are destructive. But in the United States, we&apos;ve swung hard to the other extreme. The commentary on cable networks has been comic, if viewers can stop screaming long enough to laugh. CNN&apos;s instantly infamous chyron "Ebola: &apos;The ISIS of biological agents?&apos;" is only one of the more spectacular of the genre (disemboweled by Nigerian-American author Teju Cole here). Fox News&apos; Elisabeth Hasselbeck took the opportunity for some old-fashioned time-of-plague xenophobia. 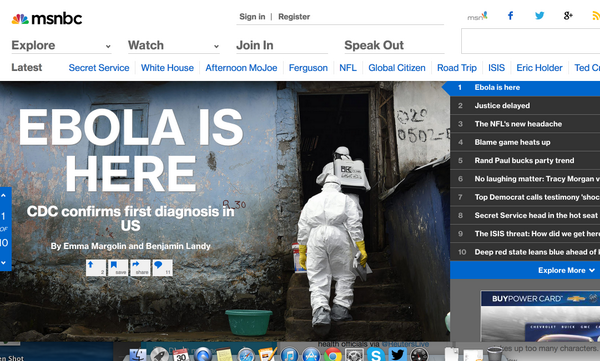 MSNBC greeted the first stateside diagnosis of the viral infection with all the subtlety of a horror movie ad campaign. And that great ad-man metaphor, viral, applies. Look at this map by Twitter engineer Simon Rogers. In early September, mentions of Ebola came from where you&apos;d expect: countries near the outbreak, with satellite interest in areas with West African diasporas, including the U.K. and the coastal United States. U.S. interest took off in mid-September, when two American missionaries and an aid group doctor were diagnosed and transferred to the U.S. Centers for Disease Control and Prevention in Atlanta. Attention dwindled again until, boom, Oct. 1, when news hit saturation that Thomas Eric Duncan, a Liberian man in Dallas, had been diagnosed; America appears to be on fire. Looking only at that stage of the map, you&apos;d think 3,431 people were dead across the United States and perhaps one or two in Guinea, Liberia and Sierra Leone, not the other way around. This disparity in attention has a substantive impact on policy. Attention from a body politic as deep-pocketed and influential as the United States generates power — to move resources, shift policy and start throwing real money around. That is why aid groups, journalists and government agencies had been trying to get us to focus on the Ebola outbreak for months. It hadn&apos;t been easy. At a high-level meeting on the Ebola crisis I attended on the sidelines of the U.N. General Assembly debates in mid-September, a Doctors Without Borders representative told officials that high demand and a shortage of funds meant the group could only keep its key clinic in the Liberian capital Monrovia open to new patients for half an hour a day. But this did not stir up new pledges for action, or debate about how best to allocate funds. President Obama, along with other heads of state, had already spoken and left. Days later, Duncan&apos;s diagnosis created the news frenzy some had hoped for. But Western attention hasn&apos;t yielded productive results. We can&apos;t even say that, as in past disasters, including 2013&apos;s Typhoon Yolanda in the Philippines, 2012&apos;s Superstorm Sandy or the 2010 Haiti earthquake, that spikes in awareness are translating into cash flows. That&apos;s not a simple debate either: Money given to aid groups in the heat of the moment is often spent on quick-fix solutions and administrative fees that have little long-lasting benefit for survivors. Yet Ebola hasn&apos;t spurred broad giving at all. That reflects the conversation on this side of the Atlantic. Americans aren&apos;t debating how to stop the dying in Guinea, Sierra Leone or Liberia — whether to entrust money to local governments to build much-needed infrastructure, for instance, or how to rush resources quickly into the zone. They&apos;re just terrified that an exotic disease for which there is no easy cure might be coming to their town. That&apos;s why the discussion has been not about fighting the disease where it&apos;s actually occurring, but about border closures and travel bans where it&apos;s not. That kind of thinking is as old as epidemics in the age of globalization. It&apos;s also terrible. Instead of fighting this narrow focus, media outlets are more or less playing along. This is partially due to the nature of news consumption online. In a media environment dominated by Facebook shares, a solid explainer on how unlikely it is that people in the United States will even so much as be exposed to the Ebola virus gets an urgent title with a hazmat photo. An interview with one of the discoverers of the disease gets a palpitating headline, with what should be the lede for Western readers buried in the bottom third: "An outbreak in Europe or North America would quickly be brought under control," the expert says, rating the potential for airborne spread of the disease "extremely unlikely." One wonders how many of the more than 40,000 people who shared that article on Facebook read that far. Instead of fighting this narrow focus, media outlets are more or less playing along. So what&apos;s the price of a panicky response? The 2010 Haiti earthquake followed years of failed, short-sighted aid interventions, including what had been billed as a massive response to four hurricanes and tropical storms that had struck the island nation little over a year earlier. When the quake struck, hundreds of thousands paid with their lives for a lack of infrastructure and strategic planning. To raise awareness, or just money, officials, aid workers and journalists rode waves of hype, misunderstanding and panic, imagining famines that didn&apos;t exist, armies of looters who weren&apos;t there and follow-on epidemics that weren&apos;t a threat. Nine months later, a United Nations system fixated on fears of Haitian disease but unconcerned about its own sanitation practices sparked a cholera epidemic that killed at least 9,000 more people, twice the known number who have died from any strain of Ebola, ever. Again, panic brought the most harmful results. There are many reasons why outsiders tend to react to disaster the way we do, CDC disaster expert Erik Auf der Heide told me last year, from media "whose business it is to make things look dramatic" to responders "indoctrinated that their job is to come in and take control." There&apos;s a tendency to fear people and situations we don&apos;t know, and to avoid dealing with threats until we feel they are imminent, even if by that time it&apos;s too late. Now that Ebola&apos;s threat to tens if not hundreds of millions of people in West Africa can&apos;t be ignored, a broad U.N. mission has deployed to the zone, and the CDC is mounting what it calls its largest-ever international response. The world is finally heeding CDC chief Tom Frieden&apos;s call to see Ebola as a global crisis and not just an African one. Here in the U.S., we&apos;re finally paying some kind of attention. We&apos;ll find out soon what the product of that attention will be.